Little BELLA’s owner didn’t want her anymore, and so she gathered all of her toys, and her beloved dog red love blanket, loaded her into a car, and mercilessly surrendered her to the Los Angeles County Animal Control – Carson , better known as the Carson Shelter. 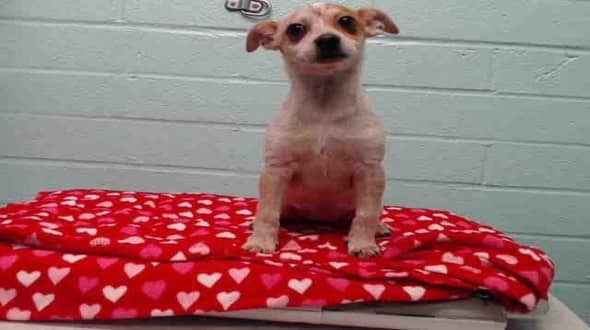 Little BELLA, who at her young age seems to sense that the stakes are high, can often be found tucked away shaking in her favorite blanket, cowering in fear from the noise and chaos that is the Carson Shelter. When the lights go out, and everyone goes to sleep, soft and subtle weeping could be heard coming from her kennel space. Little BELLA cries herself to sleep every night wondering what on earth she did to deserve her new fate. Sad indeed. 1 Response to "3 month old pup surrendered to shelter with her favorite red blanket, has sadness written on her face"